In an extreme survival situation, you can go three weeks without food, but only three days without water. That says something about how vital water is to your body. Weighing in at approximately 60% water, your body only has to lose 1% for the effects to start showing within your cardio system. When you’re exercising, and pushing your body to the limit, adequate hydration is key. The 60% water in your body performs many tasks and function. When properly hydrated, the plasma in your blood is 92% water and as your blood carries nutrients, oxygen and energy around your body, you need that to be working effectively when you’re working out. Water also helps to regulate your body temperature, and aids enzyme processes which heal and repair your body and help you to sleep well. These are all vital processes after a hard workout. 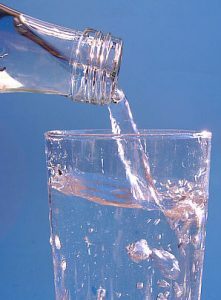 The American Council on Exercise has some good advice on quantities of water to drink before, during, and after exercise to make sure that you are properly hydrated. If you’re a serious athlete you might want to weigh in and measure more accurately how much fluid you need to replace; and if you’ve been exercising for more than an hour, you need to be replacing carbohydrates and electrolytes too. It’s really easy to increase your water intake. Try marking up a bottle with time slots so you can easily see how much water you need to be drinking throughout the day. Like with almost anything in our digital world, you can get an app to track how much water you’re drinking and to give you reminders to rehydrate. It takes barely any time out of your day and can have such important benefits to your workout programme and overall health.